It's now official - the wraps have come off the new Range Rover at the Paris Motor Show 2012. The styling is still unmistakably Range Rover, but brought up to date with styling cues from the incredibly popular Evoque. The most important change is the reduced weight – the new Range Rover is 420kg lighter than the outgoing model, which will significantly help with fuel economy. The reduced weight is possible thanks to a new all-aluminium monocoque structure. The rest of the car is improved too, with upgraded suspension to provide flatter cornering without adversely affecting ride quality. Improved road manners shouldn’t mean compromised off-road ability though, thanks to upgraded ‘Terrain Response’ technology, which analyses conditions and selects the best settings to cope with them. 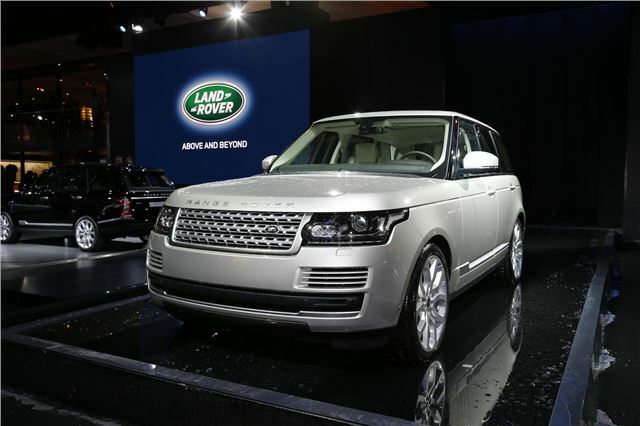 Refinement, one of the most important Range Rover attributes, has been considered. The body design, coupled with acoustically laminated glass means that road and wind noise should be minimal, while the carefully optimised suspension should offer good ride comfort. Interior space is greater than the old model, with more rear legroom. Engines offered will be a V8 petrol and TDV6 and TDV8 diesels. Weight saving has made a bit impact on performance and emissions - without the saving, it would have been impossible to offer the TDV6 in the Range Rover. It also means that the Range Rover benefits from some big drops in CO2 and now comes in at under 200g/km. The addition of a hybrid should bring this down further sometime in the near future. On board technology is said provide both front and rear seat passengers with the same peerless luxury experience, with features including keyless entry, power upper and lower tailgates, electrically deployable towbar, high-end Meridian surround-sound sound system, full digital instruments, voice control and connectivity, luxury massage seats and sophisticated interior illumination. Prices start at £71,295 for the Range Rover Vogue 3.0L TDV6, rising to £98,395 for the Range Rover Autobiography 5.0L Supercharged. Order books are now officially open with the first months of production expected to fill up immediately. Sales of the outgoing Range Rover are said to remain extremely strong. This vehicle (I refuse to dignify it by referringto it as a car), is like a bad JOKE*, subsequent re-telling only makes it worse. When are people going to wake up and realise that it is a huge con? It will never 'morph' (as in 'The Ugly Duckling'), it is chronically flawed in design; it and its predecessor have the aerodynamic qualities of a pile of telephone directories, (motoring journals passim) and you know how ghastly piles can be.....but hey, it's got lots of bells and whistles on, like bi-xenon (Byzantine more like) multi-light units,faux extractor slots in the wings and door mirrors the size of the pedal-bins in my bathrooms. IMHO from observation, it seems to be driven, in the main, (no, not at sea) by sunglasses-up-atop-the-styled-hair women, or ageing men in dodgy-looking, tie-less suits who are always in a confounded hurry, glowering at one and all to announce that they, being in such a huge, high, made-over-skip-on-wheels are going to yield to no-one. These so-called Land Rovers (owned by an Asian company) are also straining the bank balances and credit cards of psychologically 'small' people with large chips on their shoulders. This I know on the basis of probability, as the latest figures from the Treasury and the Office for National Statistics (ONS) show that the average personal debt per household is c.£32,000 - not counting mortgage debt - ergo, as I don't have a mortgage (paid off long-since after several years of personal thrift) it follows that someone in the cul-de-sac where I reside owes c.£64,000 not including his mortgage........ouch. Let's face it, the heap is anachronistic in these austere times. Having 'poked around' one or two examples on sale, I was astonished at the obsolescent-looking switches and instrumentation, compared to similar products from Mercedes-Benz and BMW. As for the 'Evoke inspired' style, I am still of the opinion that during the prototype modelling, after the wooden mock-up phase, someone, or, more likely, a group of 'operatives' happened to drop a cartoon-like !5 TONS! on the rear roofline. It looks squashed and rather silly, like the modern Mini, also a huge con, the result of heavy, continuously-applied spin and hype. Finally, for your relief, those 19/20 inch wheels wouldn't be out of place in the centre of a set of wrought-iron gates. Now they really are a JOKE*. It does look a bit ugly. It probably won't matter anyway. Naveditor, you sound a little high and mighty yourself generalizing about all who drive these vehicles. I drive the current model and I'm a thoroughly courteous individual who just happens to like a car like this to ferry round my beloved dogs. They are highly practical and a 'go anywhere' vehicle - so no matter what I need to do, like cross a stream, drive onto a muddy field or simply go shopping in comfort, it's perfect. Don't be jealous, just work a little harder like I have for many years and you'll be able to afford one too. Just remember that a person is not defined by the clothes they wear or by the car they drive, they are defined by their actions of generosity and humility.